Before knowing the DEW FACTOR lets understand the concept of moisture and condensation. It is a condensed vapor or gas diffused in the soil (pitch) itself or condensed on a surfaces (pitch) or condensed in the atmosphere. Drops of condensed moisture forming on cool surfaces especially at nights or in atmosphere or in the soil (pitch) itself ; the falling of DEW. From above you might got the sense of DEW. 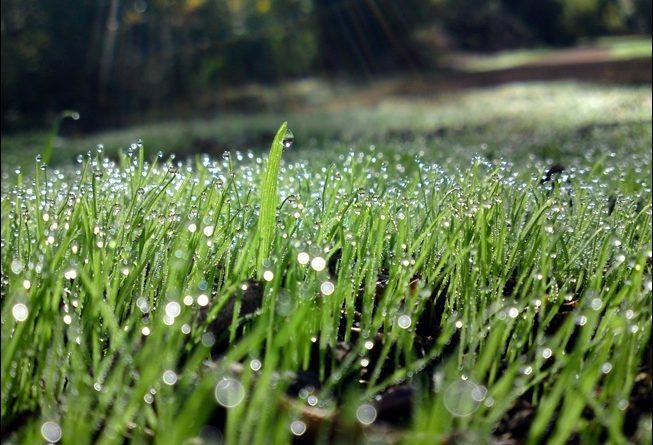 In winter seasons at nights especially in subcontinent you can see a drops of water forming on a open surface grass, which is nothing but the condensed moisture or DEW. 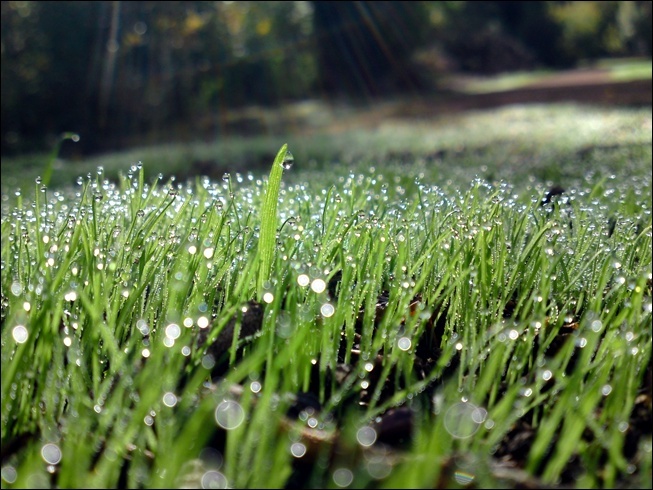 DEW is not only a just moisture but it is more denser, condensed in the form of small drops. Now you can define it as a small drops of water forming on a surface especially at nights in winter seasons due to condensation of moisture. I think now you might got the complete idea of DEW. How does the DEW effects the match ? Lets say dew is falling in late evening in a day and night match. Now when a dew falls everything on the ground becomes wet. The Outfield, Infield, pitch, ball and even sometimes the batting gloves becomes wet. The field or ground becomes wet in such a way that, the moment the ball fells on the ground it becomes completely wet and you are forced every time to clean or rub a ball with a piece of cloth. The shoe becomes wet and fields man will not be able to field well, always skidding on a grass. It seems like you are playing on a water logged surface and it displays every where on the field. It kills the ball, fielding, bowling entirely the romance of the game, but favors the batsman thanks to DEW FACTOR. As it is said earlier the dew is every where and ball becomes wet every time the bowlers feel difficult in holding the ball and especially gripping the ball. It skids always from your hand due to bad wet conditions. This is not the only worrying factor for bowlers, even the pitch makes bowlers frustrated thanks to DEW FACTOR once again. The pitch becomes so wet in such a way, you can say, even if you bowl with a nice seam position, the ball will not be able to grip or contact with the pitch, it skids, there by killing the swing and spin of the ball. And goes straighter always to the batsman, even if you spin or swing the ball. 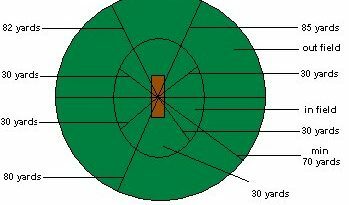 You know, Dew affected pitches can be easily compared with a 22 yard smooth plane glass which has no juice in it and always skids. If you spin a ball it doesn’t turn much, it reaches nicely to the batsman by skidding. It kills the rotation of the ball and there by killing the turn. 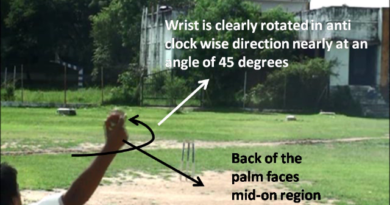 Even genuine wrist spinners feel difficult in spinning the ball. If you swing a ball it doesn’t swing much, it also reaches nicely to the batsman by skidding, just like a straight ball. It effects batsman but in good way. It becomes easy for the batsman to play any shot, as the ball reaches the bat very nicely by skidding with out turn and swing. The only worrying factor for the batsman is, some times he changes his wet gloves (Due to Dew factor), by wet gloves you cannot grip the bat properly. I think this is not the big problem for the batsman. When a Dew comes in to the party it will be little difficult for fielders to field. The hands of fields men becomes always wet, the ball skids always from your hand, the ball wont reach you in time, as the pace of the ball slows down little bit on the field due to Dew Factor, the timing misses, even your shoe might frustrate you. The shoe wouldn’t be able to grip the field or ground well and you might skid while you chase a ball in a outfield. Therefore the Dew Factor effects you in different departments of the game. But the batsman feels very much easy in these conditions. In 2007 in November Pakistan has chased 326 against India in a day and night match in Mohali. Simply the Pakistan has kept wickets in hands and used Dew Factor conditions very well and chased the big total very easily.